New Hampshire Democratic Gov. Maggie Hassan defeated freshman Republican Sen. Kelly Ayotte by a narrow margin in one of the most expensive races in the country. Hassan declared victory Wednesday morning as she clung to a 700-vote lead, but Ayotte held out on conceding the race. The race looked as if it would come down provisional and absentee ballots or even a recount, but Ayotte conceded on Wednesday evening. "I just spoke with Governor Hassan to congratulate her on her election to serve in the U.S. Senate," Ayotte said in a press release. "This is a critical time for New Hampshire and our country, and now more than ever, we need to work together to address our challenges. The voters have spoken and now it’s time all of us to come together to get things done." It was one of the most hotly contested races in the country. New Hampshire trailed only Pennsylvania in attack ads against Republicans. 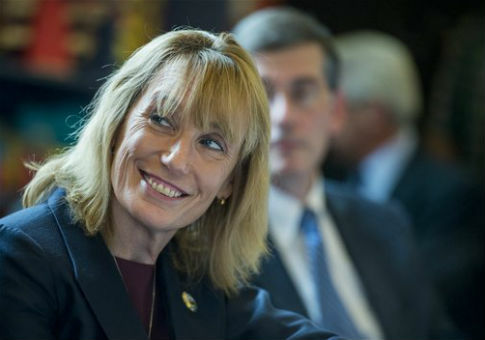 Democrats and liberal activists spent more than $53 million on ads to aid Hassan's challenge, including $48 million in attack ads, according to the Center for Responsive Politics. The state was swamped with more than $90 million in outside spending to reach its 919,126 registered voters—about $100 per potential voter—according to the New Hampshire secretary of state's office. The candidates frequently traded leads in the closing months of the race, according to a Real Clear Politics polling average. Ayotte had to overcome a 4.3 percent deficit entering the fall after Hassan and Democratic presidential nominee Hillary Clinton enjoyed surging support following the Democratic National Convention. Hassan was dogged over the closing months of the campaign with accusations of a pay-to-play scandal involving her campaign donors and a $300 million Obamacare contract, as well as stonewalling a public records request into her administration's contract with a mental health hospital. She was also engulfed in scandal after the Boston Globe revealed that her educator husband hushed up a sexual misconduct scandal involving a teacher and student. Hassan, who claimed that she never knew about the misconduct, later named the teacher to a campaign leadership committee. Hassan spent much of the race attacking Ayotte for her support of President-Elect Donald Trump. Ayotte ended up rescinding her Trump endorsement after video of his offensive comments about women became public in Wednesday. Trump, who won the New Hampshire primary, lost the state in the general election on Tuesday. Democrats failed to win back a majority despite Hassan's victory. Republicans have a 51-49 majority in the Senate.